Until recently, the NFA Branch was operating with state-of-the-art 1970′s technology – but the new electronic submission system is bringing the NFA process into the new millennium. Unfortunately, as with anything to do with the NFA, there is a lot of confusion surrounding the new system. In this post, we’re going to cover some of the details of this new submission method – as well as covering some of the pros and cons. First of all, I have to say that the new system is MUCH FASTER. Because of that, from a customer perspective you should definitely try to use electronic submissions (e-Forms) whenever possible. Unfortunately, there is a pretty steep learning curve for dealers; so, many are sticking to paper submissions for the time being. I suspect that pressure from customers will force everybody into using e-Forms pretty quickly. In our case, we are now submitting all forms using the new electronic method. All the traditional NFA forms are supported through e-Forms; but, in this article we’re only going to cover the forms that most customers will care about. Those are the Form 1, Form 3, and Form 4. Read on to get more details about electronic submission of the different ATF forms. Form 4 is the form used to transfer an existing item from a seller to you. For example, if you live in Texas and purchase a suppressor from us, we will submit a Form 4 to handle that transfer. If you live outside Texas, we will do a Form 3 transfer to a local FFL/SOT license holder and they will take care of submitting the Form 4. Using an electronic Form 4 is definitely one of the biggest wins when it comes to time. As an example, we are currently seeing paper Form 4 submissions come back from 9-10 months ago; but, electronic submissions are being processed in a mere 3-4 months. As of the middle of October (2013), we started submitting all of our Form 4′s using e-Forms – and we’ve gotten a pretty good feel for how the system works; although, there have definitely been some bumps in the road. At this point, we have several thousand already in the pipeline at the NFA Branch. How errors will be processed with electronic Form 4′s is still a bit unclear, so we’re spending quite a bit of time reviewing each application to prevent as many errors as possible. With paper Form 4′s, an error isn’t much of a problem – but it does have the potential to be a big problem with e-Forms…The reason I say it could be a big problem is that the NFA Branch may simply disapprove electronic forms that contain errors. The e-Form system would still be faster; but, it would essentially double the time of any transfers that are disapproved.I understand the frustration from customers when we call asking for specific trust pages or other information – but we’re spending a lot of time making sure each application is as ‘perfect’ as possible before submitting. Many customers who use trusts are used to writing the $200 tax stamp themselves with paper forms; but, with e-Forms, that is no longer an option. Instead, you will need to pay the FFL/SOT holder directly for the tax stamp, and they will turn around and pay the ATF. If we’re handling the Form 4 submission for you, we will send a link to purchase the tax stamp immediately after you place your order.In the past, the best way to know the NFA Branch had received your application was waiting for the tax stamp check to be cashed; but, with e-Forms you can call and get status as soon as the transfer is submitted. In our case, we will send you an email confirming the ATF has accepted the electronic transfer. You can’t submit an electronic Form 4 on your own – even if you create an e-Forms account. The reason for this is due to the fact that the FFL/SOT has to have an account that is specifically linked to their inventory in the NFA registry.With a paper submission, it was possible to fill out your own Form 4 and simply get a signature from the FFL/SOT. If you take this approach, be aware that it will NOT be submitted electronically. Due to glitches in the e-Form system, it isn’t always possible for an FFL/SOT to submit the forms right away. We’ve found that if we submit 100 forms in a night, then we may have 5-10 that don’t go through for a variety of reasons. On those problem forms, we work with the NFA Branch to get the submission problems corrected ASAP so your form will be accepted.Because of that, there is a slight possibility that your e-Form will be accepted 2-3 days after we submit it; but, that’s still a huge win when it comes to the overall time. Also, you will receive a notification from us confirming that the ATF has accepted your transfer. You can’t submit an electronic Form 4 if you’re registering as an individual. Using a trust or corporation was already slightly faster; but, with the arrival of electronic submissions, an individual registration could take 3 times longer. It isn’t possible to submit an electronic Form 4 with just a ‘serial number’. Because of this, we’ve stopped offering the option outside of a few cases where it could wind up being faster.In general, you’re better to wait until a suppressor is in stock so it can be processed electronically, so please let us know if you’re interested in an out-of-stock item and we’ll notify you as soon as we have it for you. 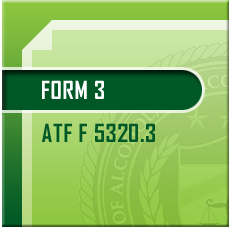 Form 3 Understanding ATF e FormsA Form 3 is used to transfer an NFA item from one FFL/SOT license holder to another. For example, if you live outside of Texas, then we will do a Form 3 transfer to an FFL/SOT in your area and they will handle the Form 4 transfer to you. Remember that it doesn’t matter at all if the FFL/SOT in your area is using e-Forms – we can still do an electronic transfer to them. Since there are quite a few FFL/SOT holders who aren’t yet using e-Forms, it’s a good idea to check with the FFL/SOT licensees in your area to see if you can find somebody who is using the new system. Although the biggest overall win with e-Forms is with either a Form 1 or Form 4, an electronic Form 3 is also significantly faster. Aside from the electronic Form 3′s that were impacted by the infamous government shutdown, we are consistently seeing approvals in the 2-3 week range. Many FFL/SOT holders are still expecting incoming transfers to take 90 days or more; but, with e-Forms, that is no longer the case. Although most customers don’t care about the details of a Form 3 transfer, there are some changes that may impact you (at least indirectly). If your FFL/SOT is going to file an electronic Form 4, they will need to wait until we receive the approval to ship to them. It is no longer possible to ‘overlap’ the Form 3 and Form 4 transfers.Fortunately, the electronic Form 3′s are clearing fast enough that it isn’t a huge issue; but, don’t fall into the trap of wanting a paper Form 4 so you can ‘get the process started’. You truly are better to wait and get your paperwork filed electronically in a couple of weeks. With electronic Form 3′s we no longer rely on keeping outdated licenses on file for transfers. One of the best parts of the new system is that it allows us to sync our FFL/SOT records with the ATF each time we do a transfer – so we always have the latest & greatest information!This is a huge win for us, and our Form 3 transfers are progressing more smoothly and quickly than ever. Another big advantage of e-Form 3′s is that we can track them from the moment they are submitted to the moment they are approved. With the paper system, we faxed our forms in and there was no confirmation or ability to check status for about 2 months; which, in the case of a lost submission, was a serious problem.Now, we’re able to enter the transfer directly into the NFA Branch’s system – and the approval arrives as an email that is automatically associated with the customer order. That allows us to bypass any of the areas that could potentially cause problems before!We also have a record of each transfer so we can reference them immediately and directly when we talk to the examiners. In the past, we’ve had the ability to email a copy of the Form 3 to our customers so they can have it as a reference. We are continuing to do that; but, the Form 3 we’re sending out is what would have been submitted under the old system. We aren’t sending out the new e-Form 3′s because of the possible confusion it may cause (see the next bullet point). The last thing to keep in mind with e-Forms has more to do with FFL/SOT holders; but, these forms are now fully populated using the ATF’s own data – and the format has changed a bit.This is leading to some confusion, but it hasn’t been a huge deal – and we’ve been working with FFL/SOTs to help them understand the new format. It’s always fun to submit a form that says a Sparrow suppressor was manufactured by AAC – or Silencerco manufactured a 762-SDN-6. If you are going to build your own suppressor or convert an existing weapon to be either an SBR or SBS, then you can use the electronic Form 1 directly. In order to create an account, simply go to this page and start the process: https://www.atfonline.gov/EForms. Remember that filing a Form 1 means you are building something yourself – or acting as the manufacturer. Because of that, we can’t submit a Form 1 on your behalf – just like you wouldn’t be able to submit a Form 4 for us. Having said that, we do quite a bit of this and are happy to answer questions if you have them. Most of the pros and cons I already mentioned about electronic Form 4′s also apply to electronic Form 1′s – so I won’t rehash them here; but, below are some quick tips that should make the process a bit easier. The homepage for e-Forms claims that you should use Internet Explorer – but we’ve found the reality to be quite a bit different. In fact, we’ve had the best luck with Google Chrome (although we use IE for everything else).Regardless of the browser you use, be prepared for an exercise in frustration when using e-Forms. Just be patient because it does eventually work. You will need to upload a document containing your trust – and the individual parts can’t be more than 3MB. There is also a limit of 10 parts total, so the entire trust can’t be more than 30MB.For many people, this is the hardest part because you’ll need to be able to scan in your trust document. Please note that the uploaded file MUST contain all pages of the trust as well as any attachments it mentions (like Schedule A). It must also show the signatures and notary stamps, so don’t just upload the PDF document the lawyer sent to you. Along with the trust, you also need to upload a copy of your signature. The best approach here is to print out the first page of the Form 1 and complete boxes 7, 8, and 9. Then scan in the page and upload it as part of your electronic Form 1 submission. Keep in mind that the NFA Branch now wants the information you will be engraving listed in box 4H – which I suspect is due to many people not realizing the engraving was a requirement for a Form 1. Overall, the electronic submission of ATF forms is a big jump forward for the NFA Branch. As I already mentioned, there is a big learning curve for FFL/SOT holders; but, for customers, there isn’t much downside. Hopefully, in a couple of years we’ll all be looking back at the current 9-10 month wait times for paper forms as a thing of the past!